I’m SO happy that November is here – it’s probably the best month for an American food blogger, given the entire country’s hype around food. November also happens to be our first magazine feature (did I spill the beans too soon?). 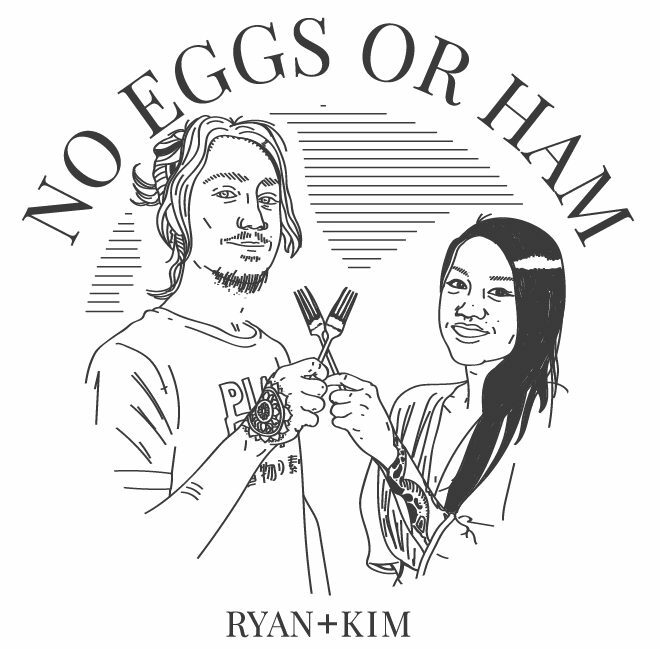 That’s right, No Eggs or Ham will have a couple of recipes inside the November issue of Vegan Lifestyle Magazine! We can’t believe it either. But enough about us, let’s talk about food. Sausage Gravy & Biscuits is a meal I grew up with and ate every single Thanksgiving and Christmas morning. Soft, pillowy biscuits were drenched in creamy, savory, spiced sausage gravy. Looking back on it, it’s kind of like my modern diet’s nightmare: meat, dairy, and wheat?! IT’S FRIDAY THE THIRTEENTH ALL OVER AGAIN. Although there’s no reason to get worked up, since any food can be adjusted to fit one’s dietary needs. This meal is no exception – all it needed was a few biscuit test trials. See, biscuits aren’t a complicated food. To make them, cold fat (normally butter) is cut or rubbed into a mixture of flour, leavening agents (baking soda & baking powder), and salt, leaving small, flat flakes of butter in the dry ingredients. Then, buttermilk is stirred in to bring the dough together, which – because of its acidity – will assist in browning as well as rising. Comparatively, making biscuits is quite similar to making pie crusts, the only differences being that biscuits have more moisture and leavening agents. Now, I reckon that biscuits acquire their magical voodoo not from their ingredients, but from how they’re made. So, what if we just replace the unacceptable ingredients – wheat flour, buttermilk, & butter – and call it a day? It sounds simple, but alternative flours behave differently than wheat flour. Thus, subbing out wheat flour for sorghum flour, for example, would leave us with biscuits that have a mealy, dry, cornbread-like texture, which isn’t what we’re going for. So, to achieve proper texture, a blend of flours is needed. We made three test batches before accomplishing the ones you see in these photos, during which time we discovered that cassava flour lends a sticky, moist texture. Our first batch, which was made exclusively from cassava, came out a bit gummy, stretchy, and dough-y. Our second batch, containing 2 parts cassava and 1 part sorghum flour, came out slightly mealy & dry, not completely unlike biscuits served in low quality restaurants. The third time around, we used 7 parts cassava and 1 part sorghum flour, which created a moist and lightly chewy biscuit with just a lil’ grit to it, without any of the gumminess of our first batch or dryness of our second batch. Now, I’m not going to tell you these are exactly the same as wheat flour biscuits, because they aren’t. Compared to normal biscuits, they are lightly spongy and not as flaky. However, they are still identifiably biscuit-like in texture & flavor. The biggest contributor of flavor in normal biscuits comes from butter, which – unfortunately – I don’t eat the normal stuff OR the vegan substitutes…. until I stumbled across a hidden gem in the grocery store: Nutiva’s Buttery Coconut Oil, which is a product made out of organic coconut oil, ethically sourced Red Palm Oil, and magically tastes like butter. Honestly, I don’t know how they do it, but this stuff smells and tastes like the real deal. Better yet, it contains no moisture, meaning it’s shelf stable, i.e. you ain’t gotta refrigerate it. Nutiva’s buttery coconut oil contributes that traditional biscuit flavor that people think of when they think of biscuits. But, if you can’t find the stuff, coconut oil can be used in its place to create the same texture, only without the buttery flavor. Whichever fat you decide on, it’s important to chill it prior to use, as it needs to go into the dough while solid, then melt once in the oven. If the fat melts while you’re handling the dough, it’ll become runny and the texture won’t be as flaky as it can be. Another traditional element in biscuits is buttermilk, which is a creamy, fermented, tangy milk often used in southern recipes. In baking, buttermilk’s most important element is its acidity, which is similar to that of yogurt. Thankfully, all we need to create a vegan buttermilk substitute is light coconut milk – or a half/half mixture of full fat coconut milk & water – and a touch of acidity such as apple cider vinegar, white distilled vinegar, or lemon juice. Simply mix them together a few minutes prior to baking and you’ll have a buttermilk substitute that’s ready for any southern recipe. I should also mention that you will notice that all of the biscuit recipes are measured out via weight – grams for the dry ingredients and ounces for most of the wet ingredients. I don’t do this because I have a secret tie to the kitchen scale industry. I call for the ingredients to be measured by weight as it’s the most accurate method of measuring dry ingredients, which is crucial to achieving the correct results when it comes to baking. For example, the difference between a cup of compacted cassava flour and a loosely packed one can have a difference of 30 grams, which can mean the difference between moist biscuits and desert dry biscuits. So, for the most desirable results, weigh your ingredients! Because I’m a good ‘ole Florida boy, these biscuits remind me of childhood; they’re fluffy, buttery, and lip-smacking good. They’re great when freshly baked, sliced in half & toasted until lightly caramelized, or served under a bed of hot, flavorful, mushroom gravy. Mushroom gravy is obviously quite different than the sausage gravy I grew up with, being that it has no pork, no milk, and no wheat roux. Instead, our gravy is more on the “sophisticated” side of the culinary spectrum… for once. To create the gravy, sautéed onions and garlic are pureed with arrowroot starch and a healthy dose of black pepper. Then, that slurry is stirred into nutmeg and rubbed sage seasoned mushrooms that’ve been reduced down to a third of their original size. Once the gravy has thickened, an herbal uplifting is brought about via fresh thyme leaves. If whole mushroom slices in gravy isn’t your thing, there is an option available to make their texture resemble ground sausage. To do such a thing, prior to cooking, pulse your mushrooms in a food processor until they break down into fine chunks. Because their size is much smaller, they’ll also require less cooking time. Either way go, you’ll have delectable mushroom gravy in your tummy. This Thanksgiving Day, take the time to enjoy a soulful breakfast that’ll fill you with bounds of energy for the rest of the day. We hope you enjoy our first Fall Favorite of the month ~ we’re so excited to show you what’s in store these coming weeks! Savory, nutmeg spiced mushroom gravy is lathered on top of buttery biscuits - free from gluten, dairy, and lectins. The perfect, resistant starch-packed breakfast for Thanksgiving Day. Biscuits: Place 1/4 c of butter or coconut oil into a small bowl and set in fridge for 15 minutes to firm up. Lightly grease a cookie sheet with a touch of butter or coconut oil and pre-heat oven to 400° F.
Shake together coconut milk and apple cider vinegar in a mason jar or personal sized blender, and set aside. In a large mixing bowl, whisk together cassava flour, sorghum flour, baking powder, nutritional yeast, baking soda, and salt. Break off the chilled butter, into the dry ingredients, one small chunk at a time (reference photo in post). Using your hands, rub the butter into the dry ingredients, flattening out the chunks without fully incorporating them. A few large remaining flakes is okay. Create a well in the center of the ingredients and pour in most of the coconut buttermilk, reserving a few tablespoons in the cup. Stir the dry and wet together until there aren’t any noticeable dry spots. If the dough is crumbly, add the reserved liquid and stir to bring together. If, however, the dough sticks together but is still dry enough to handle, don’t add the additional liquid. Using a 1/3 c measuring cup, scoop out a hunk of dough, transfer to hand, and round out the edges. Transfer biscuit to pre-greased cookie sheet, lightly flatten to about 1 1/2 inches thick, and repeat for remaining biscuits. Note: the biscuits lightly touch one another on the pan, as this will help them rise. For extra browning and flavor, brush a ‘lil coat of melted butter right on top of the biscuits. Then, place cookie sheet in oven & bake at 400° F for 15-20 minutes. Check them after 15 minutes – if they’re moist in the center, but them back in for a few minutes. You’ll know they’re ready when the edges are lightly browned and the center of the biscuits are soft – but not mushy – in the middle. Let biscuits cool on sheet for at least 5 minutes before devouring. Mushroom Gravy: Heat a large soup pot over medium heat. Once hot, add 1 tablespoon of butter or olive oil, followed by the onion and a pinch of salt. Cook – stirring occasionally – until the onions have softened, turned translucent, and begun to brown. Add in minced garlic and cook another 2 minutes, or until the garlic begins to brown. Transfer onions and garlic to a food processor or blender along with mushroom broth, coconut milk, arrowroot starch, black pepper, and a large pinch of salt. Blend on high for 1 minute and set aside. Place the same large soup pot as before over high heat. Add in 1 tablespoon of buttery coconut oil or olive oil, followed by the mushrooms, sage, nutmeg, and a pinch of salt. The mushrooms will exude a lot of moisture – cook them until all of it has evaporated; about 10 minutes. Then, lower the heat to medium-high so they don’t burn. Stir often until the mushrooms are lightly brown and greatly reduced in size; about 7 more minutes. Once the mushrooms are fully cooked, add the onion/mushroom broth mixture to the pot. Turn heat up to high and cook – stirring constantly – until the mixture comes to a boil and thickens. At this time, taste for seasonings and adjust accordingly – adding more black pepper for bite, nutmeg for holiday spice, salt for saltiness, or sage & thyme for herbalness. To serve, cut biscuits in half and top with however much mushroom gravy your heart desires. Store any leftover gravy in an airtight container in the fridge for up to three days and store leftover biscuits in a plastic bag or airtight container on the countertop for up to three days. To reheat, slice biscuits and half and place under the broiler until they’re hot and lightly browned. Heat gravy up in a small pot over medium heat until hot and bubbly – about 5 minutes – adding a splash of water to thin it out as desired. *You can create your own lite coconut milk by mixing 1 part full-fat, canned coconut milk with 1 part water, which is what I normally do. So in this case, mix 6 oz (3/4 c) coconut milk with 6 oz of water. *If you decide to use ground up mushrooms – as mentioned in the post – they will cook faster than described in the recipe. For ground up mushrooms, cook over medium high heat until they start to brown, about 10 minutes. Follow everything else as described. I can’t have any yeast products due to allergy. Can I just omit it from the recipe? Thank you for sharing this! I’ve pinned it to try making on my next day off! It looks delicious! Thanks for the kind words Elaine. It’s true, hopping into a lectin-free diet can be intimidating, but once you get adjusted, you’ll find that you’re able to eat a diverse and highly enjoyable diet. Healthy wishes in playing around with your new diet! Looks lovely, please read my first post on depression! I’m glad to hear someone enjoys sausage gravy & biscuits as much as I always have. Thank you for the kind words!